Annan and Clyde had to be content with a share of the points in a game that possibly neither team deserved to win, a result which leaves both teams little or no chance of making the play offs. It was a game ruined by terrible weather conditions with the cold wind, and blustery snow making it a very tricky afternoon for both teams. Annan were unchanged from their mid week defeat at Montrose while Clyde made one change from their mid week victory against Elgin City with Kevin Nicoll replacing Adam Martin. After a goalless first half where both teams created opportunities Clyde took the lead in the 64th minute after Kevin Nicolls shot through a ruck of players gave the visitors the upper edge but within 5 minutes Annan squared the match when Annans goal scorer Blair Henderson hit a low wind assisted shot from 20 yards which appeared to catch Blair Currie out with the shot slipping past the outstretched arms of the ex Annan keeper. Both teams appeared to stroll through the first half. Clyde started the game well and they almost went ahead when Mitchell’s attempted clearance cannoned off fellow player Swinglehurst with the rebound going narrowly past the post. Shots from Kevin Nicoll and Jordan Stewart although not seriously testing Mitchell sent out a warning from the visitors. The best opportunity of the half fell to Annan in the 12th minute when Rabin Omar’s intelligent through ball into the path of Blair Henderson sent the Annan striker in on goal but Henderson showed no composure and missed the target completely, it was a rash decision by the striker who should have done better from the perfect opening created by Omar. Annan playing against the strong wind looked comfortable defending anything that Clyde could throw at them and it was difficult to recall either keeper having a serious save to make in the first half. 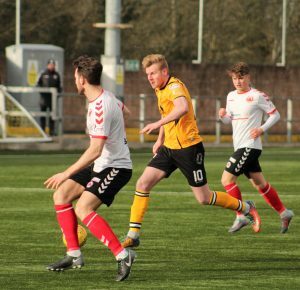 If the weather conditions in the first half were difficult they got worse in the second half when a blizzard of snow whitened the park before the sun once again appeared but with the wind in their favour Annan had the slight advantage. Aidan Smith had a well struck shot saved by Blair Currie on the hour mark. Clyde took the lead in the 64th minute after Martin McNiff’s throw in was collected by David Goodwillie who muscelled his way into the penalty box to set up Kevin Nicoll who’s low shot from 10 yards through a ruck of players found the corner of the net to give Clyde the advantage. Annan responded five minutes later when Blair Henderson atoned for his early miss with a fine individual goal after he collected the ball in the middle of the park and drove forward to finish with a low 20 yard shot which slipped past the outstretched arm of Blair Currie. Annan’s Evan Horne was fortunate when his clearance from McStay’s cross ball was cleared over his own bar from 3 yards. Goodwillie and Boyle had half chances as the game progressed towards full time. Annan pressed forward for the final few minutes and Rabin Omar came close with a well struck shot which produced a good save from Currie. It was game where neither team deserved to win with both teams chances of making the play off places out of their hands. Annan Athletic – Alex Mitchell, James Creaney (Jack Brannon 79min), Scott Hooper , Steven Swinglehurst, Owen Moxon, Scott Roberts ( Connor O’Keefe 68 min), Ryan Sinnamon ( Ben Armour 68 min) , Rabin Omar, Aidan Smith, Blair Henderson. Substitutes not used – James Atkinson, Jamie Henry, Peter Watson ,Cameron Salkeld. Clyde – Blair Currie, Keiran Duffie, Jordan Stewart, Martin McNiff, Dylan Cogill ( Jordan Lowdan 87 min), Kevin Nicoll, Barry Cuddihy, Chris McStay, David Goodwillie, Ray Grant ( Jack Boyle 63 min), Mark Lamont. Subs not used , Steven Kipre, Smart Osadolor, Max Wright, Adam Martin, Kyle Gourlay. It was a day when Montrose took a giant step to the title after a late Lewis Milne goal secured the victory over Peterhead . Cowdenbeath lifted the points with a 3-1 home victory over Elgin City. Edinburgh City lost a late late goal to deny them victory over Stiling albion who snatched a 2-2 draw to keep them on course for one of the play off places. Berwick Rangers match against Stenhousemuir was called off due to a waterlogged pitch.